Naughty Dog brings us a lengthy DLC, from the Uncharted series featuring a story following the events of Uncharted 4 with Chloe and Nadine. You take control of Chloe in this case; as she is on the hunt for the Tusk of Ganesh, and tries to beat a war lord by the name of Asav. Who is in the middle of a war himself. The lost legacy takes place in India, which is great because it is a new location. But 90% of it takes place in a jungle like all of the other Uncharted games (a change of scenery would be nice in this series). In the beginning of the game, we see the characters struggle to trust each other and work together. As the story continues we find out a little bit more about the history of the characters. Especially Chloe, and who her father was. Come to find out she is finishing what her father began. Nadine’s story is a bit different and is satisfying to find out what has happened to her and shoreline, and how she acquired the organization. The characters seem to get closer as the story progresses with some minor bumps along the way. 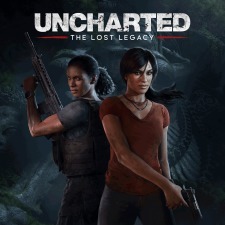 Lost Legacy is a great expansion of the series and I hope to see a full triple A title featuring these two characters in the future.